You see, most of us start blogging and online businesses to share a little piece of ourselves with the world. But what happens if we fail? If our blogs don’t take off, or our businesses stop generating profit? Should we just give up on our dreams and pretend that we didn’t want them that badly in the first place? Cathy Heller doesn’t think so! 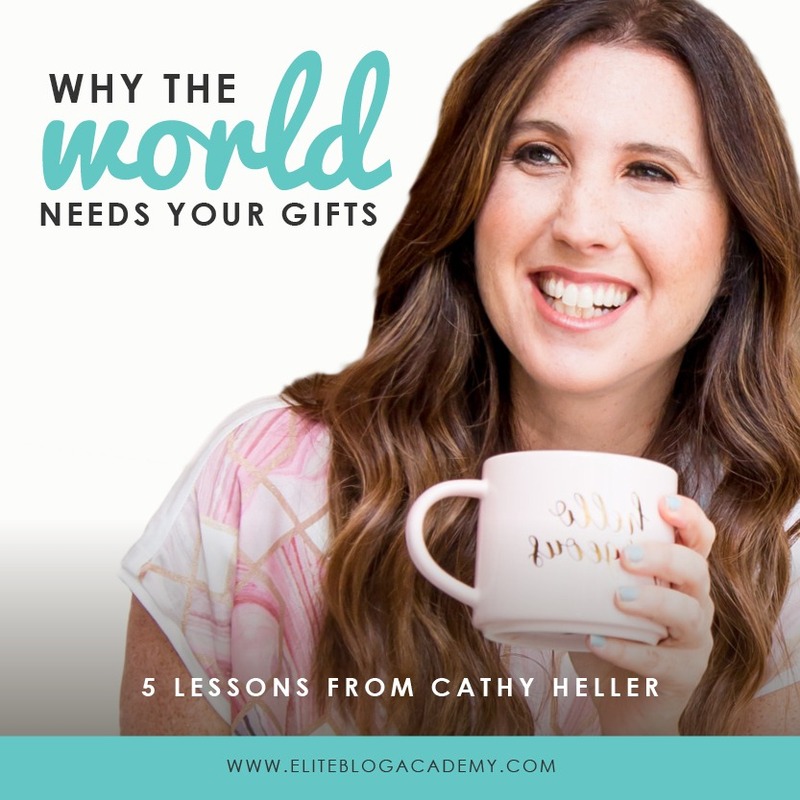 As the amazing host of the popular podcast Don’t Keep Your Day Job, and one of the most encouraging people I know, Cathy has made it her mission to help others share their gifts with the world. And, Cathy’s no stranger to failure herself. She dreamed of becoming a recording artist and worked really hard to achieve that dream. Her hard work paid off when she got a record deal from Interscope, only to be dropped a few months later. She picked herself up and landed another deal with Atlantic, only to be dropped a second time. Faced with rejection, she started to give up. But, ultimately, she didn’t quit–she pivoted her dream. In this episode, Cathy shares her wisdom about the importance of being in alignment with your gift, why resourcefulness matters, living through the messy middle, and how amazing life can be when you’re willing to share yourself with the world. I guarantee you that her story will inspire you to share with own passions with the world, even when it gets hard. Get the synopsis below or listen to the whole podcast on iTunes or on Google Play. (Or just search for “Do It Scared” on your favorite iPod app!) Never miss a new episode by subscribing on iTunes. You can also find the full show notes at https://doitscared.com/episode24/. Every person walks around and wonders, does it matter? Am I making a difference? And what Cathy’s realized is that the opposite of depression is a sense of purpose. Every person needs to be in alignment with doing something that they love and when they do that, time stops because that’s their gift. Cathy states that “everybody has that zone of genius, and sometimes people don’t take enough time to explore different aspects of themselves.” People are told so often that, “you’re not good at that,” or “you are good at this,” or “why would you even think this?” And as a result, we quit too soon, before we even discover what our calling is. What is that thing that we do well? Is it our ability to listen to other people? Is it our cooking ability? Is it the fact that we paint well? Is it the fact that we sing well? But the truth is, we all have this thing we absolutely love to do and following that passion is the key to finding our sense of purpose. The most magical thing Cathy has ever learned is when you believe something is possible and something is doable, you’re going to take action. You’re going to get creative. You’re going to get resourceful. You’re going to ask some questions. You’re going to start trying things. Because you don’t think it’s futile, because you know that it’s going to happen. And that’s when incredible things happen. It is okay to not be a superstar and super famous at what you do because there’s a lot of opportunities in the middle. Cathy has experienced the same thing with her music. Even though she knew that becoming Beyonce famous was not quite in the realm of possibilities, she realized there was another way to pursue her passions. She just leaned on her ability to do things, even when they’re not perfect, and be messy. And she thinks that just going out and doing things takes a lot of courage because it’s not comfortable, but it is getting you one step closer to the life you were meant to live. Cathy had to pivot her career after getting dropped by record label after record label. She states that “I didn’t even know if the songs were right or good, but I had to start where I was. I had to start somewhere and make a messy version or an okay version or a mediocre something.” The problem for most people is that we just quit way too soon. One of Cathy ’s favorite songwriters, Ed Sheeran, talks about quitting in a really relatable way. He says, “Imagine if you were going to go skiing, and you walk into the cabin. It’s cold. It’s Vermont. You’re going to be there for four days. And you turn on the faucet in the kitchen, and the faucet’s coming out brown, sludgy water. And you say to your friend, ‘Oh, forget it. We can’t stay here. Like, no.’ Your friend says, ‘Just hang on. Just let the water run. No one’s been here for three months. It’s going to be okay.’ And then the water starts to run clearer and clearer and clearer.” And what Ed Sheeran said is, “That’s like your work. You’ve got to push through that brown, sludgy water to get to the things that are brilliant.” Seth Godin reiterates this message by saying “You have to have the courage to tell mediocre stories until you can tell brilliant stories.” It’s just that matter of keeping going no matter what and making it through the messy middle. Whether you’re starting a business, whether doing a decorating project at home, whatever it is that you decide to do, we always start out with this huge amount of excitement and enthusiasm, and “This is going to be great. It’s going to be awesome. I love it. I’m so excited.” And then, you get a little further, and all of a sudden, something happens. You hit a roadblock, you hit something, you get dropped by your record label, whatever it is, there’s that thing, and all of a sudden, it’s not exciting anymore. It’s hard. And that’s the real part of it. And that’s the part that’s so essential, and yet at that part, so many people quit because it feels hard. But don’t quit! It’s worthwhile because it’s hard! You’ll never get to the end if you don’t finish it. Like mentioned above, there will be a point where pursuing your passion feels difficult, but while you are going through the messy middle, don’t compare your behind-the-scenes mess to people’s highlight reels. When you are looking at someone else, and you’re saying, “Look what they did.” You’re not seeing them in the hours that they were spending and the days and the months that they were failing. We have to turn things around and look at it differently. What if we looked at failure or rejection as information and as a sign that we’re being courageous? You’re going to get the feedback of where you serve the best and where you can make the biggest difference in the world. Cathy states that “ultimately we are all seeking that feeling of purpose. That’s the cherry on the top anyway.” By following your purpose and putting your blinders on, and following your own path, you will make it through the messy middle. So many people are afraid to go after the bigger picture stuff because they are scared that they don’t have it all figured out. The thing is, it’s okay to not have a big plan. For Cathy, her big plan of what she has now looks very different than what her big plan looked like seven years ago, to the point where she wouldn’t even recognize the plan or the person that she has become in that time. And that’s okay. You don’t have to have it figured out. Just come up with something and then take action on it and then see what happens. And if that doesn’t work, do something else. The clarity follows the action. Just put what you want into the world, “I’m going to try my hand at this,” and what happens is you will be led, and it will all sort of come. The clarity comes, the confidence comes, opportunities sprout. It just starts with the courage to take the first step. You see, the number one indicator of someone being successful or not is their resilience, their creativity, it’s their resourcefulness. So you take two people, somebody who’s naturally athletic and someone who’s not, and if this person who’s naturally athletic just sort of shows up to the game, okay, so it’s going to work for a little while. But if this other person who’s not naturally athletic, hustles, and they’re creative and they’re resourceful and they get themselves psyched up and they do anything they can to stay at it, they’re going to crush everyone, and it’s the same thing with business. Take that first step and then all you need to do is figure it out as you go along and the rest will come!